Editor's note: A shorter version of this commentary appeared in the Lansing State Journal on June 29, 2008. Perhaps it takes $4 a gallon gasoline to restore reason to U.S. energy policy. President Bush has called on Congress to lift the ban on off-shore drilling for oil and gas. Recent national polling indicates that consumers struggling with higher costs for food and energy have shifted their opinion — a majority now supports the development of offshore oil and gas reserves. This change in public opinion presents an opportune time to reconsider directional drilling for oil and natural gas under the Great Lakes, which was prohibited by state law in 2002 and by federal law in 2005. Forbidding directional drilling was bad energy policy then and it's bad energy policy now. Based on an analysis prepared by the Senate Fiscal Agency in 2002, continuing the practice would have resulted in an economic benefit to the state of approximately $1 billion. Adjusted for the price of oil today, the economic benefit of tapping Michigan's Great Lakes reserves would be $3 billion to $4 billion. State geologists estimate that approximately 30 wells could be directionally drilled under the Great Lakes. Directional drilling, also called slant drilling, is performed at an angle, allowing placement of the well head onshore rather than on a drilling platform in the lake. While director of the Department of Environmental Quality in 1996, I was approached by oil companies interested in exploring for oil and gas under the Great Lakes. After consulting with then-Gov. John Engler, I asked the Michigan Environmental Science Board (a group of scientists mostly from universities with environmental and natural resource expertise) to examine if directional drilling under the Great Lakes posed any threat to natural resources. The Board concluded: "[T]here is little to no risk of contamination to the Great Lakes bottom or waters through releases directly above the bottom hole portion of directionally drilled wells." The Board went on to say: "There is, however, a small risk of contamination at the well head." The board made recommendations on steps that could be taken to mitigate any impact to the Great Lakes from the well head, including locating the wells at least 1,000 feet from the shoreline and implementing proper waste disposal measures. Before the ban, eight wells had been directionally drilled under the Great Lakes without environmental harm. Even though environmental safeguards recommended by the Michigan Environmental Science Board were put in place, the Michigan Legislature still voted to ban directional drilling under the Great Lakes. The day before the vote, I received a call from a state senator who apologized in advance for voting for the ban. He acknowledged that directional drilling posed no real environmental threat, but told me that it was the right "political vote." Unfortunately, such actions are all too common among state and federal legislators who would rather reap the short-term perceived political benefit of appearing "green" without taking responsibility for the long-term damage done to energy supply and jobs. No matter how bullish one might be about alternative energy, experts agree that we will be dependent on oil to meet our nation's transportation and energy needs for many years to come. 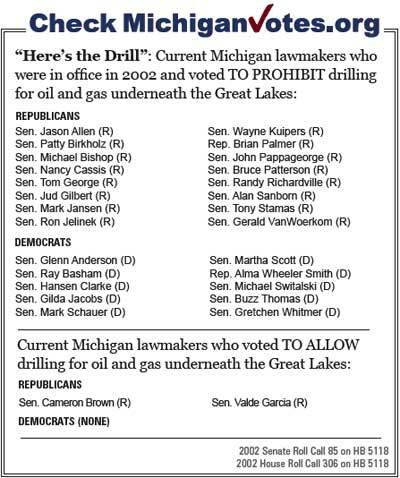 Our leaders in Washington and Lansing should encourage the responsible development of our abundant oil and natural gas reserves by eliminating arbitrary road blocks such as the ban on directional drilling. By doing so, they would display a sincere attempt at meeting the nation's energy needs while providing a much needed boost to the state's lagging economy. Additionally, our state leaders should reject the worn-out argument that Michigan does not have enough untapped oil and gas to make a difference - a reasoning that if followed ensures a permanent energy stalemate. Russ Harding is director of the Property Rights Network and senior environmental analyst at the Mackinac Center for Public Policy.